North Coast Community Housing and Community Sector Banking have partnered to offer shared equity home loan opportunity to eligible purchasers of NCCH properties … the program is called “Unpack for Good“. 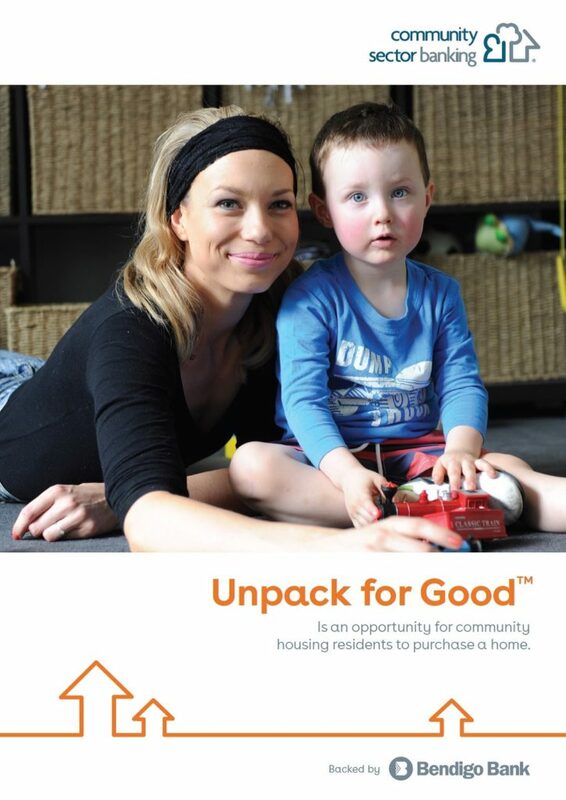 Unpack for Good™ is a unique pilot program that helps people living in community housing or buying into one of our developments, purchase their own home has launched in the Northern Rivers. Pioneered by Community Sector Banking in mid-2018, Unpack for Good aims to address demand for more affordable housing in regional areas. Under the pilot, residents will be able to co-own their home with NCCH; sharing ownership lowers the cost of purchasing the home for residents, meaning they can buy a home that would otherwise be unaffordable. The remainder of the property’s cost is made up by a regular Community Sector Banking home loan. It’s the first time this type of agreement has been launched with community housing providers and a banking service in the Northern Rivers. Not only does it assist residents into home ownership, it also frees up housing stock for community housing providers, allowing them to assist more people. “We’re excited to be offering Unpack for Good, which is one of the missing pieces in offering home ownership opportunities for those on low to medium incomes to realise the great dream of home ownership,” said John McKenna, CEO of NCCH. The housing affordability crisis in the Northern Rivers is well documented and this opportunity will allow people on low to moderate incomes the possibility of home purchase in a NCCH development. “We know that safe, secure and affordable housing is the cornerstone of people building productive and healthy lives. This program is being pioneered by Community Sector Banking and a number of regional Community Housing Providers without government involvement – providing a hand up rather than a hand out,” said Andrew Cairns, CEO of Community Sector Banking. The first packages are being offered to a limited number of eligible purchasers in NCCH’s Mill Yard Project in Mullumbimby. How does the Unpack for Good program work? Residents co-own their home with NCCH. By sharing ownership, they can buy a home that was otherwise unaffordable. The resident contributes up to 5% and NCCH contributes 20% of the property’s cost. The remaining 75% is a regular home loan through Community Sector Banking. For more information on how the scheme works and eligibility criteria please download the Unpack for Good brochure here.